First up is something I finished back in June. 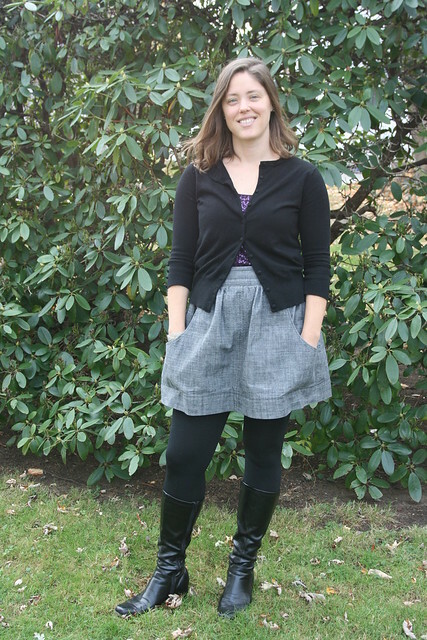 It’s the Eucalypt Woven Tank Top & Dress Sewing Pattern from Megan Nielsen Patterns. 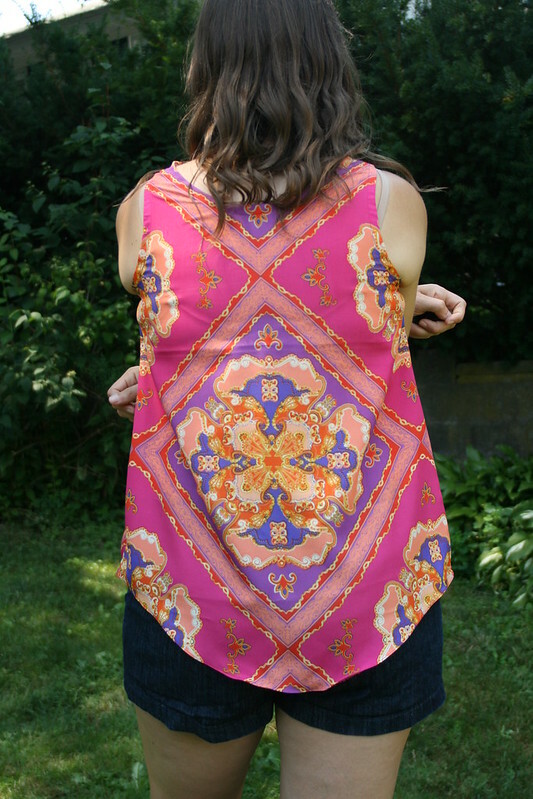 I have had this pattern for ages and have been wanting to make it, but haven’t until this summer. 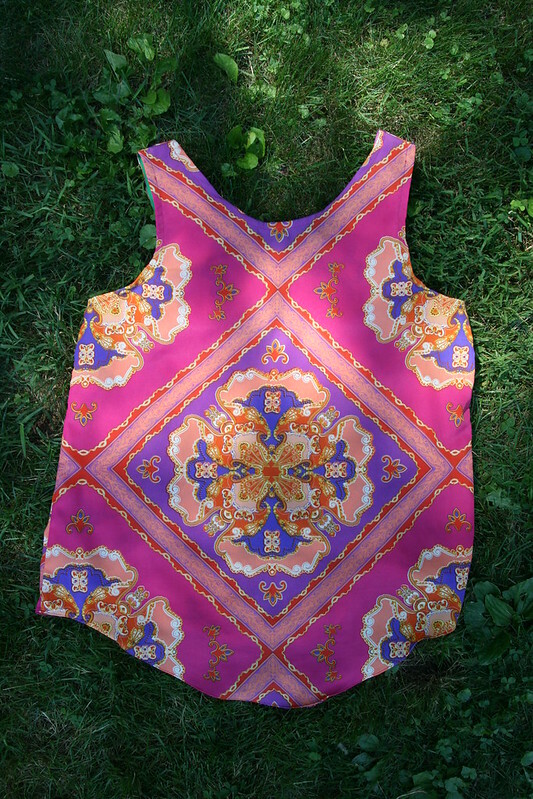 I made two different versions of the tank in the same fabric. 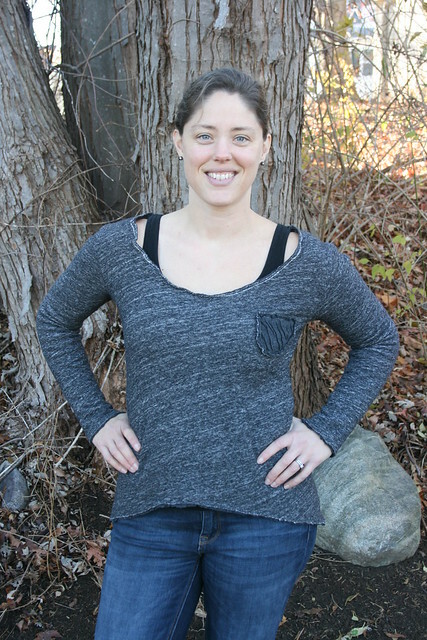 Version one was a bit tight across the back and the bust and was also a little tight on the front armscye. I decided to go up a size on the bust and make a straight large for my second version since I was having some tightness all around. Version two turned out a lot better! I’m much happier with the fit overall. So, now, here is my quandary. There are a few fit issues despite how comfortable it is. 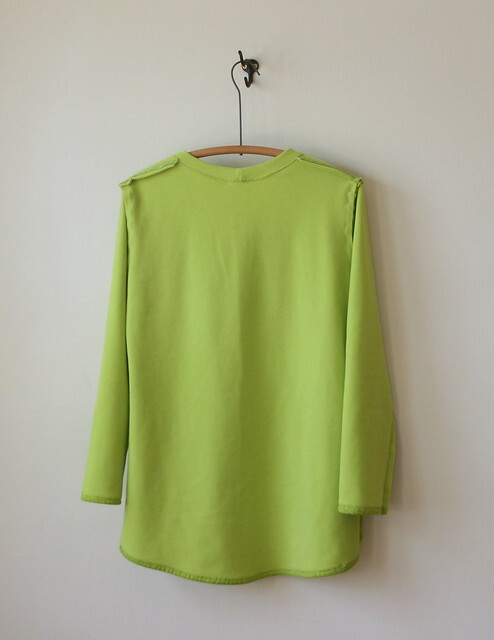 The shoulder seam line looks like it is too far back. 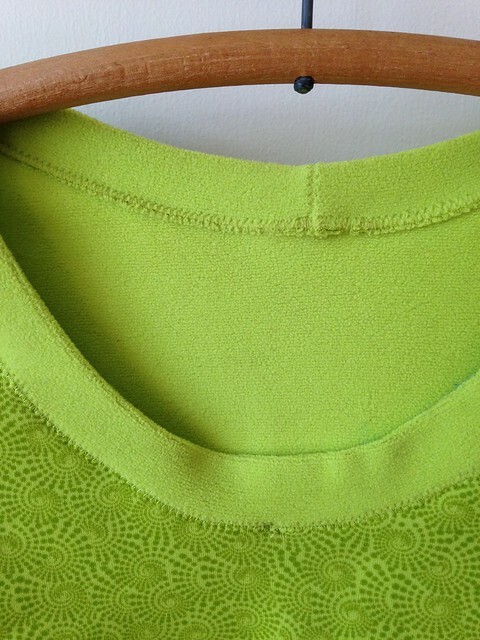 The side seam also curves as it reaches the top in a way that I’m sure it is not supposed to. 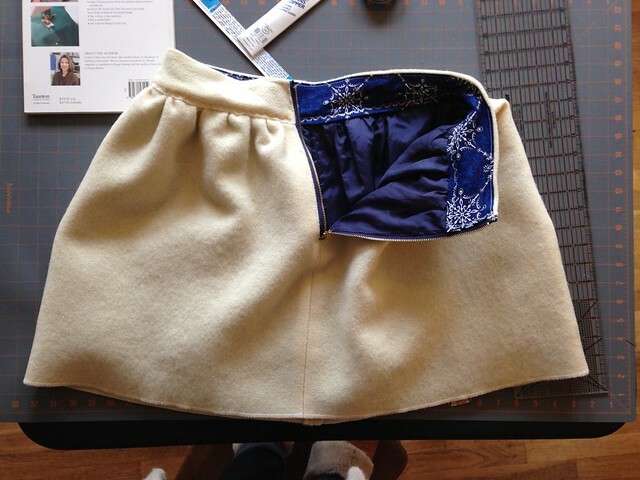 And I have some excess fabric in the back, that makes it look like I need a swayback adjustment. 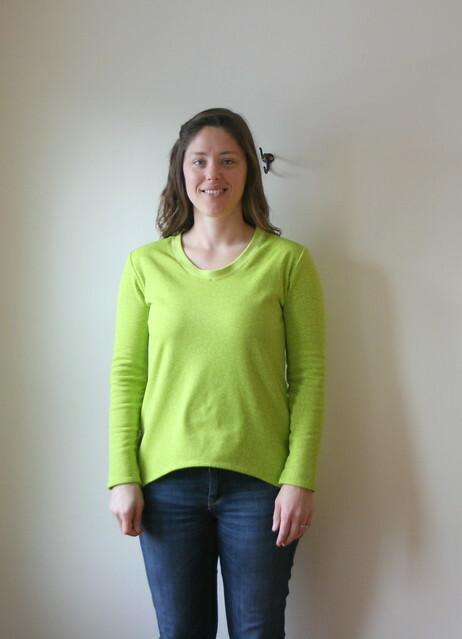 If I wear the top as is, it is comfortable and provides good undergarment coverage. 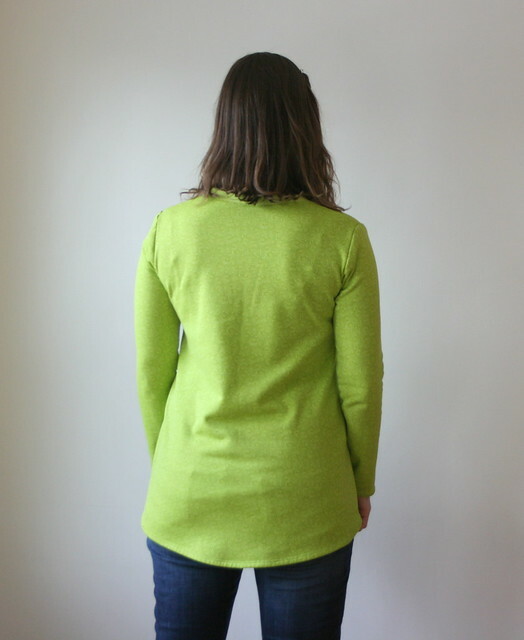 If I pull the shirt forward so that the shoulder seam sits where it should, the swayback problem disappears, but I have gaping in the armholes that make it look like I need a dart. So, do I just ignore the weirdness and make any future tanks just like version two? Do I do a swayback adjustment to get rid of the excess or add a dart? Do I tinker with it? Do I care enough to do a bunch of stuff? I don’t know. 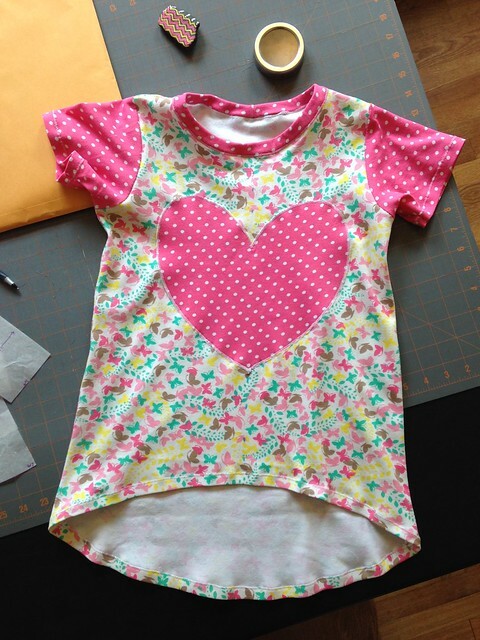 It is really nice to have a quick and easy pattern that you like and can just whip up. What would you do? 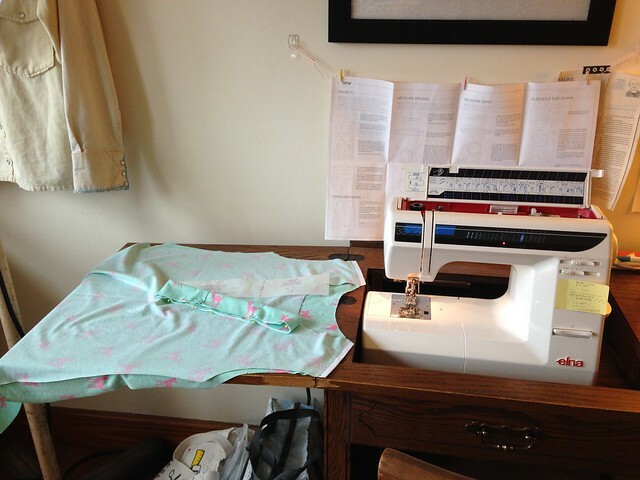 Lastly, ever since I finished my 2017 Make Nine, I’ve sort of been floundering around with my sewing. I feel like I have a very short attention span, want to sew all the things, and get tempted by new patterns left and right. I missed that sense of purpose I felt when I made my MakeNine goals, so I decided that since summer is really only half over (we have until the autumnal equinox in September! 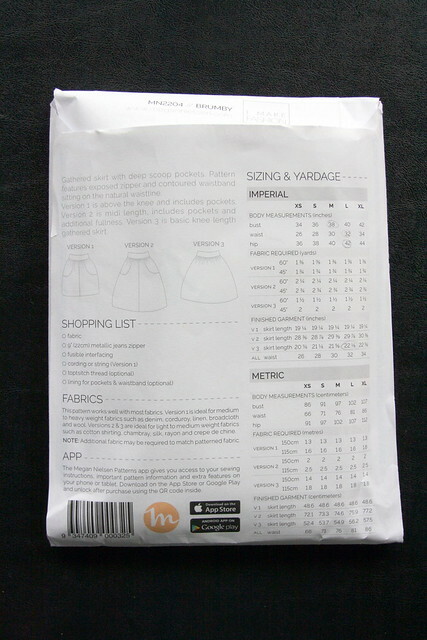 ), I was going to make a summer sewing plan. One of my new Instagram discoveries is @plantsonpink . It is literally pictures of plants in front of pink backgrounds. Why is this so satisfying? Well, I do like plants, pink, and pink and green! Speaking of plants, I’m really enjoying going through Six Seasons: A New Way With Vegetables by Joshua McFadden with Martha Holmberg. He breaks the year into the normal four seasons, but then divides summer down into three (giving you Spring, Early Summer, Midsummer, and Late Summer, as well as Fall and Winter). The recipes in each section highlight various vegetables that are in season at that time. I’ve learned to love vegetables in recent years, so I’m always looking for new and creative ways to use them. I was up in Exeter, NH with family on a recent Thursday and happened upon the Exeter Farmer’s Market. It’s amazing! It has a great variety of produce, meat, baked goods, flowers, and so much more. I was really impressed. I definitely recommend it if you are in the area on a Thursday. I’ve heard New Zealand is beautiful. It sounds like a great place to visit. And here is one more reason to want to go–the safety video from Air New Zealand! 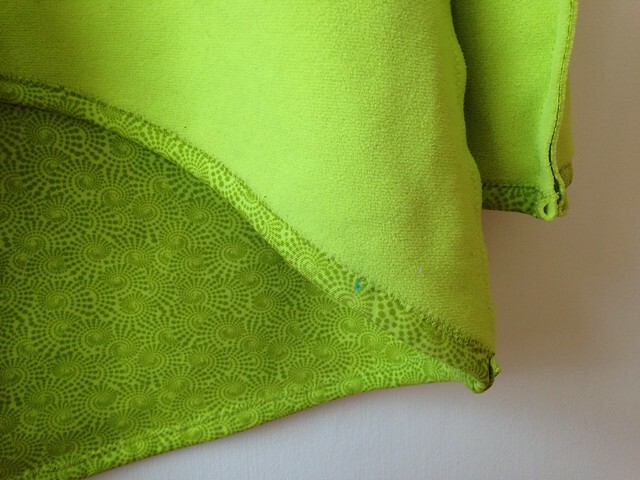 And here’s the last of my unselfish sewing…EVER. Ok, just kidding. At least for now. I made myself another Briar top (by Megan Nielsen patterns) as well as two Mini Briars and one mash-up of an adult Briar and a kids’ Briar. This is now my third Briar (number one in a double-layer knit is here and number two in Polartec is here), but it’s my first time making a Mini Briar. 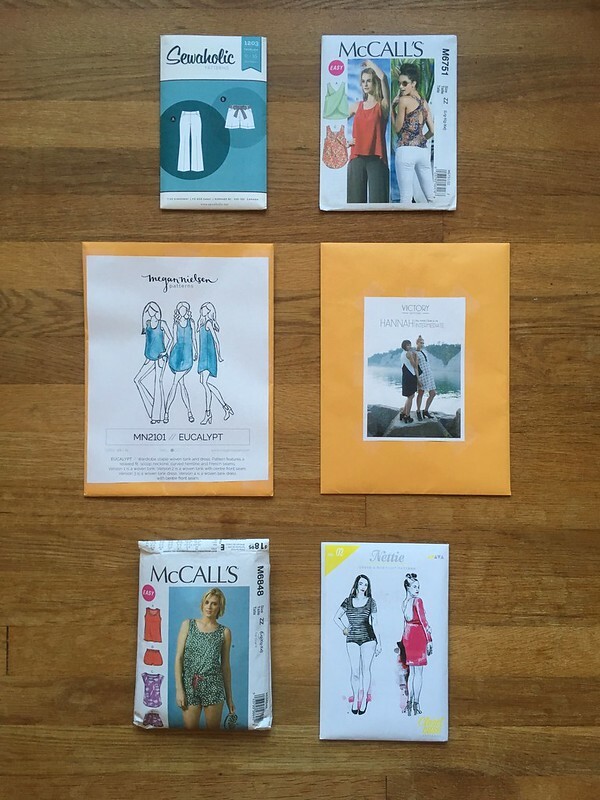 I received all three of Megan’s children’s patterns as a thank you for being a pattern tester for the Mini Tania culottes (which are super-cute, by the way). The children’s Briar is similar to the adult version, although not identical. It came together very easily. 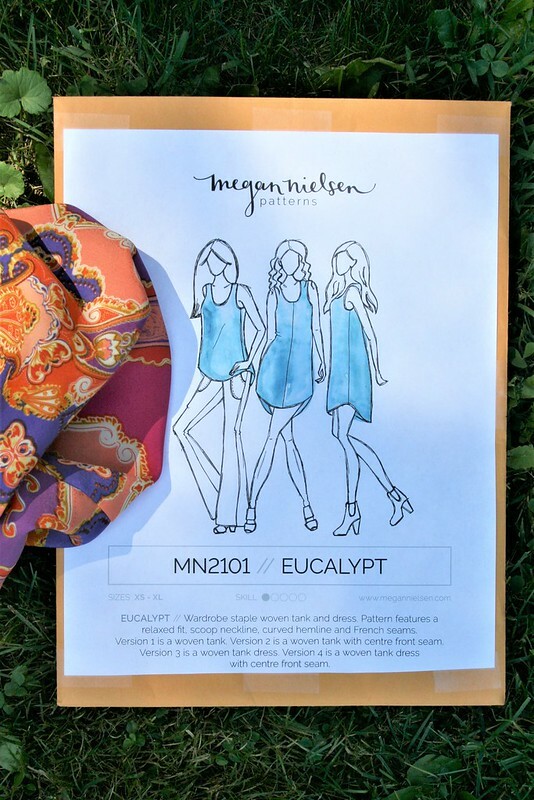 One thing I love about Megan Nielsen patterns is their visual clarity. 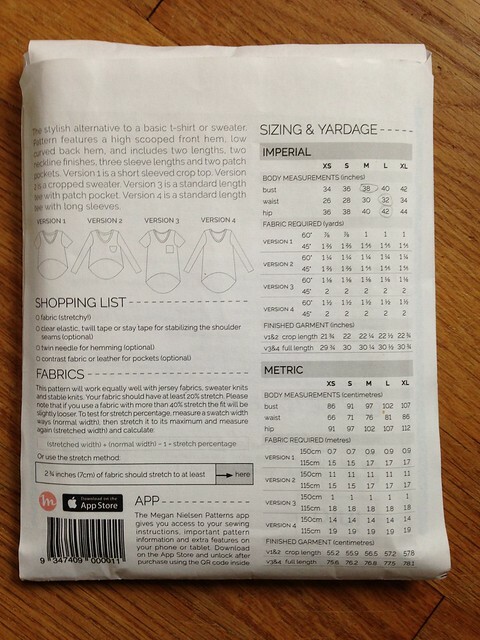 When I first started sewing garments, I was always intimidated by the busy and complicated look of the standard patterns you find in chain fabric stores. Megan’s patterns are completely opposite to that. They have a clean look to them that makes you feel confident you will be able to understand them. Actually, I think that is the case with a lot of the independent pattern companies, which is a big plus. 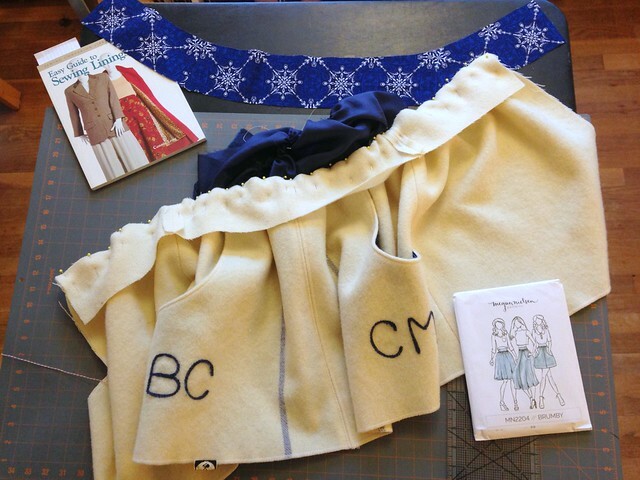 It is a great advantage to have the same pattern in a kids’ version and an adult version when you are sewing for someone who doesn’t quite fit in either range, but is somewhere in the middle. 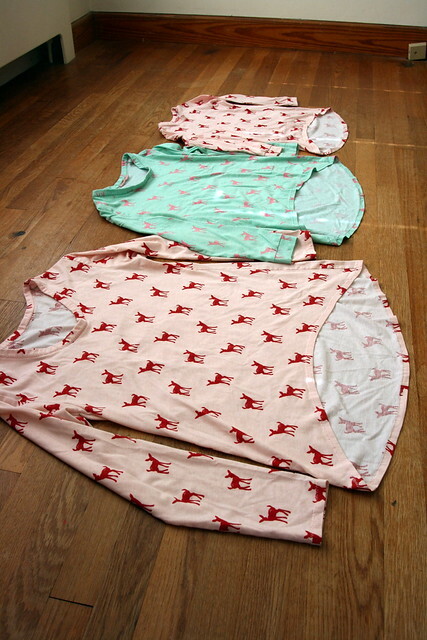 This was the case with the aqua and pink shirt. 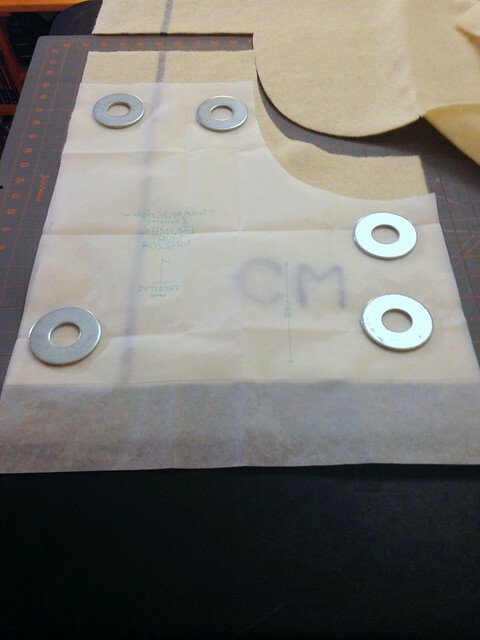 It was great to be able to pull both patterns out, compare sizes and make a custom pattern from the two of them. 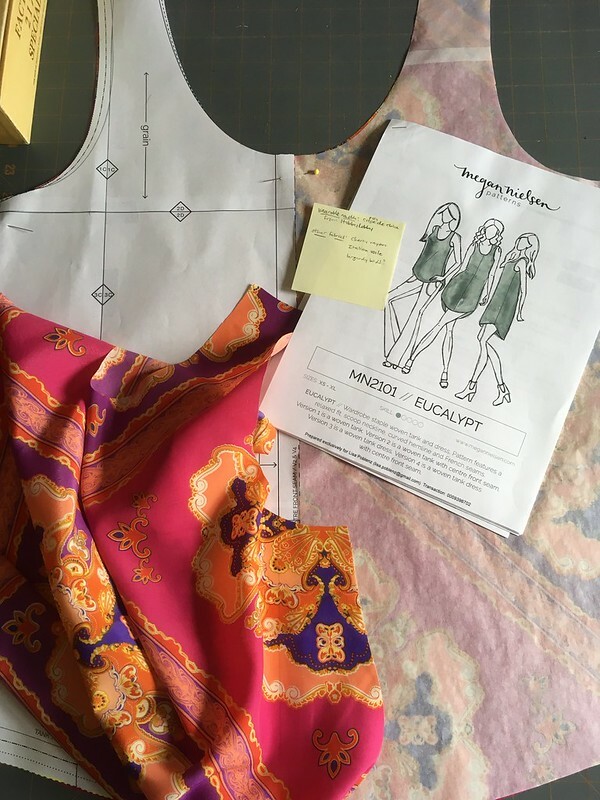 It was a bit of a head-scratcher at times, trying to figure it all out and make the best-fitting pattern possible, but all the problem-solving is one of the things I really like about sewing, so I enjoyed the challenge. 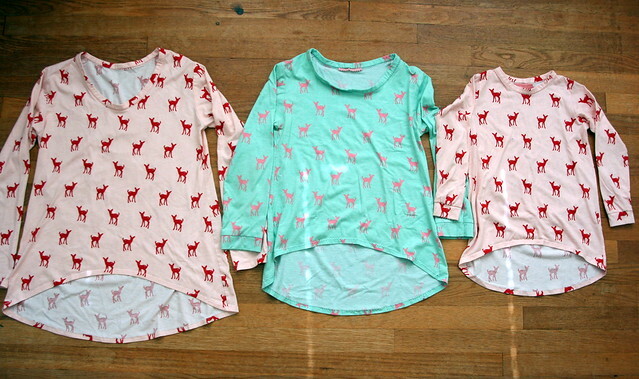 I ordered all of the deer fabric from Girl Charlee. It’s a poly/cotton blend, so we’ll see how it wears over the long run. 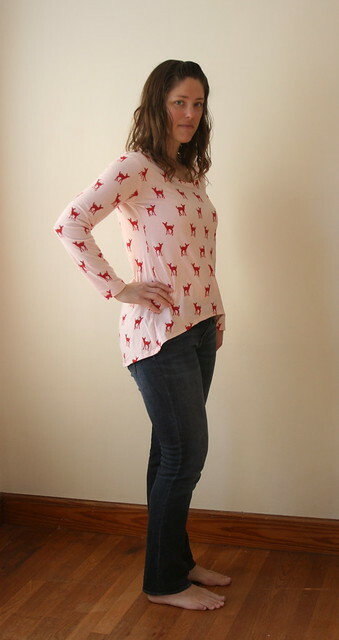 The fabric for the short-sleeved Mini Briar is left over from a long ago project and is from Jo-Ann’s. Sewing all these up reminded me that while I really love sewing knits because they are so forgiving, I still have a lot to learn. I’m getting better at choosing stitches that work well, but I still get wavy collars that don’t sit right. Part of the problem is that, in most cases, I’m not quite sure what I’m doing wrong. 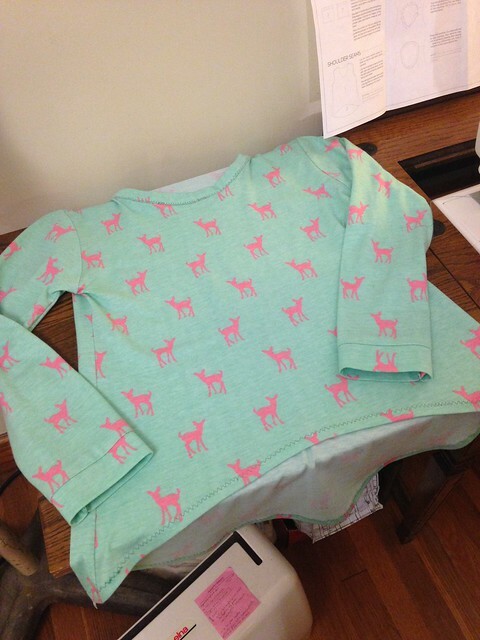 In the aqua and pink shirt, I raised the neckline, but still used the original pattern piece for the neckband, which I should have shortened. Lesson learned. As for the other ones, they are pretty close, but not quite right. Ironing helped, but I think I still need more practice. Oh, well! Here’s some fun stuff to check out over the weekend. I’ve been listening to a lot of the folk/bluegrass music of Sarah Jarosz lately. I don’t have a broad knowledge of music, but when I find someone I like, I tend to play their music to death. I always figured that the one everyday clothing item I couldn’t make was shoes. Then I saw these ballet flats that Jodie of Scared Stitchless made. I’m happy to be proven wrong. These are amazing. Here’s another cool music video for you this week: Wintergatan–Marble Machine. The music is made by marbles being run through a machine by the artist. Fascinating and lovely. This wasn’t the post I had planned to write to accompany these pictures. This, my first attempt at Megan Nielsen’s Briar pattern, didn’t turn out exactly right. I was going to fix it and then show you my before and after pictures. But I didn’t fix it. I might, but I haven’t yet, and I decided it was better to show you the shirt as it is and update you if I ever do alter it. Because I actually love it how it is even though it didn’t turn out the way that I planned. So here are the details. 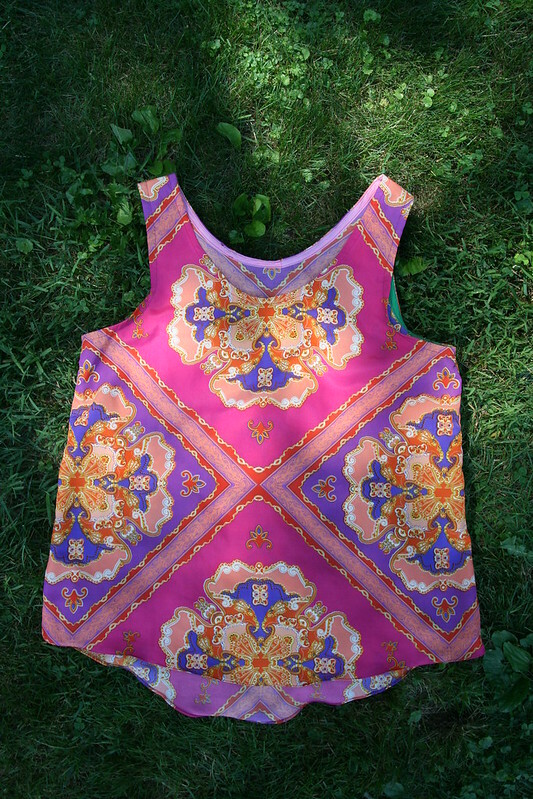 I got this super-cool fabric at Pintuck & Purl in Exeter, NH a few months back. 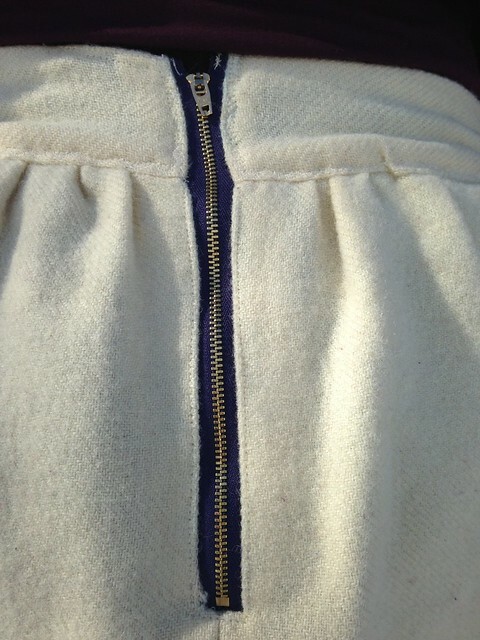 It’s a double layer combination of a wool knit (or it may be a wool-blend; I can’t remember) and a cotton jersey layer. It was originally smooth on both sides, but I took a small bit and threw it in the washer and dryer to see what would happen. It shrunk, but the wool layer didn’t completely felt, and the jersey scrunched up in a cool way due to the shrinkage of the wool. 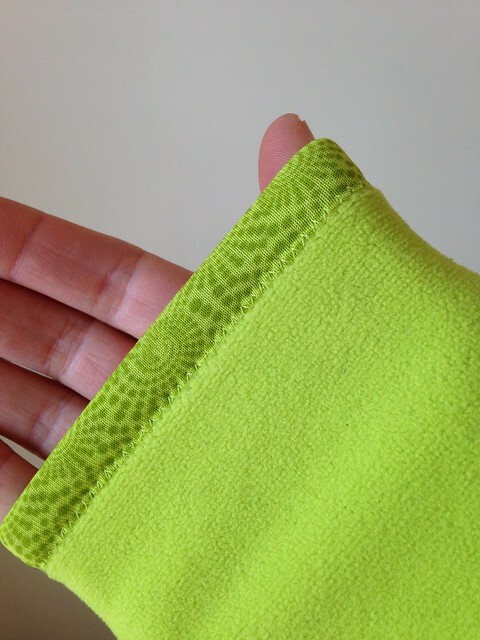 You can imagine that this made for a pretty stretchy fabric, and I knew I was taking a risk with it, not only because of the stretch factor, but because the shrinking had really thrown the grain off. 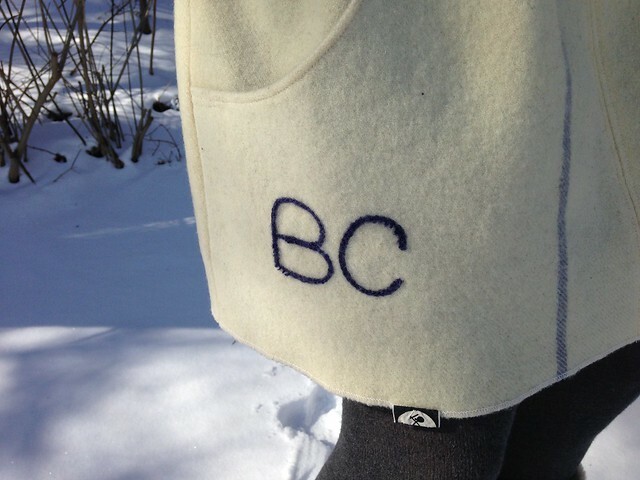 It just seemed like the perfect fabric for a super cozy Briar, though, so it had to happen. 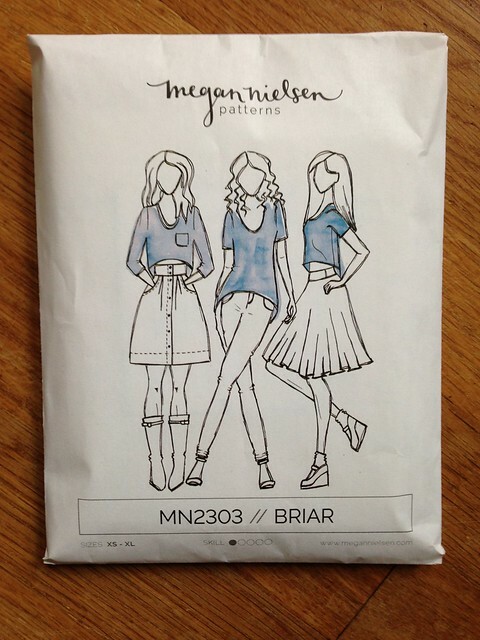 The Briar pattern has been my favorite Megan Nielsen pattern since I discovered that company, and when I heard it was coming out in paper form, I bought a copy as soon as it was available. That’s pretty rare for me. 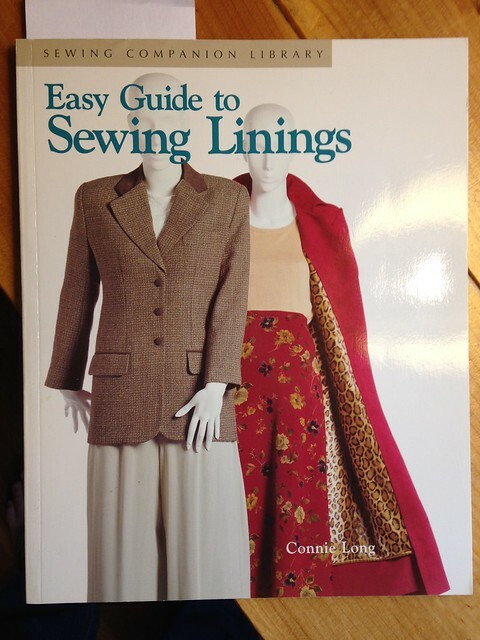 I don’t have a ton of “sewing money”, so I tend to window shop for ever and buy very carefully. I knew I wanted this pattern, though. I thought that a Briar in this fabric had a lot of potential for a relaxed, rough look with some exposed seams and unhemmed edges. 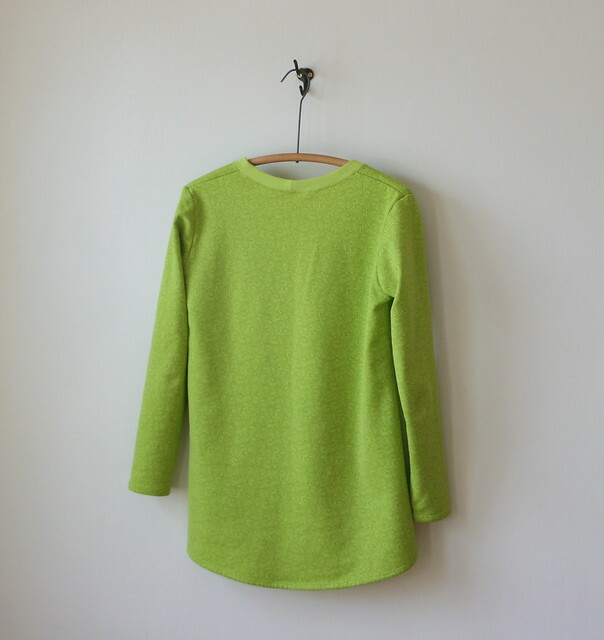 I really love knits and I sew with them pretty frequently, but despite that, I’m not really awesome with them yet. 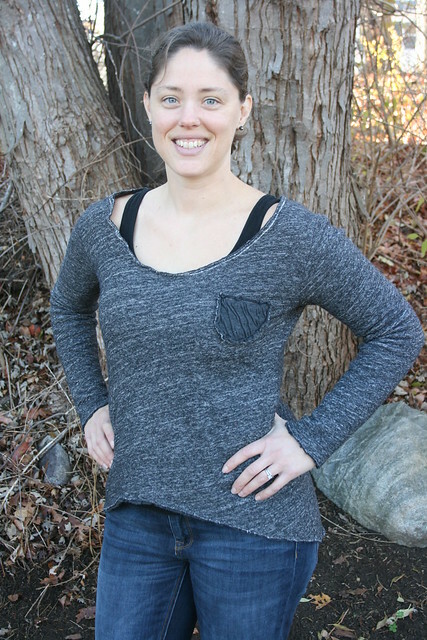 This is a pretty well-explained, straightforward pattern, but I ran into some problems with the neckline very quickly because of my fabric and what I thought I wanted to do with it. I didn’t stabilize the shoulders although I see now that I should have. 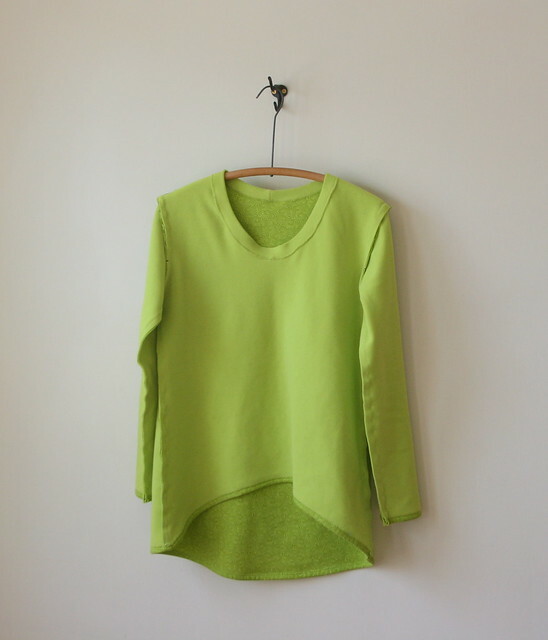 I also tried to simply sew a strip of fabric cut on the cross-grain around the neckline so it would have a raw-edged look. The neckline seemed to sort of get wavy, though, and grow. That’s when the frantic internet-answer-searching began. 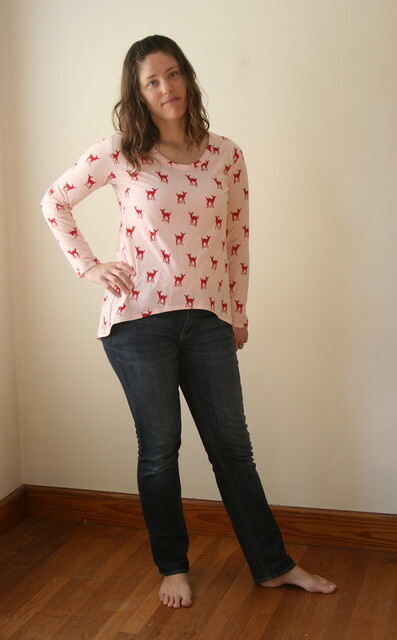 I finally left a blog comment for Lauren (of the blog Lladybird) to ask about the wavy neckline, and she gave me some great tips, but it was already a little too late for this shirt. The waviness was there (because by that time, I had taken off the strip of fabric and just zig-zagged the edge) and I was afraid to mess with it any more. I do have to thank Lauren, though. I don’t know her at all. 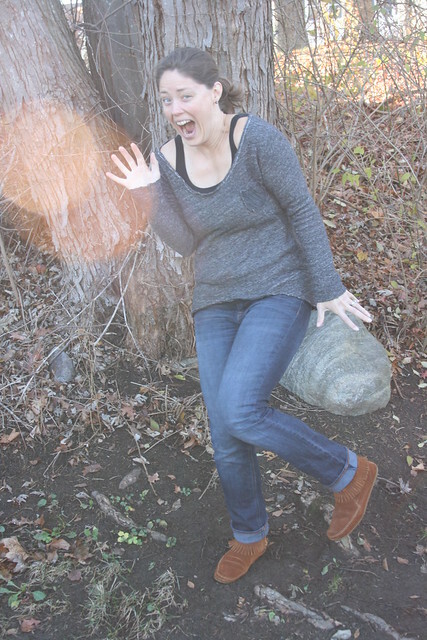 I just follow her blog, but whenever I have needed an answer (how to use Flickr for my blog photos; how to fix my knit fabric disasters), she has always gotten back to me. Thanks, Lauren! At that point, I decided to leave the neckline alone and just finish. 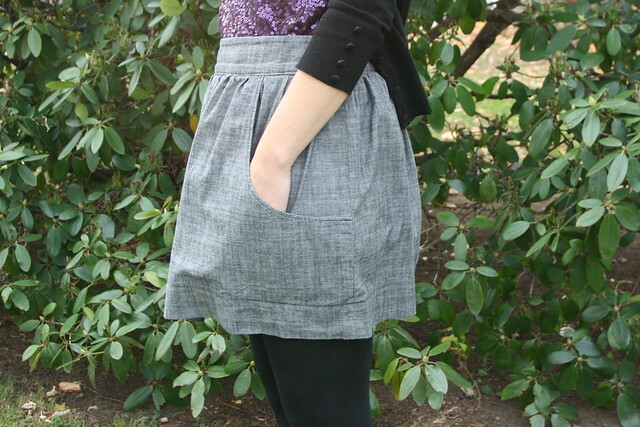 I thought about putting a sparkly zipper (also from Pintuck & Purl) in the back, but once I got to the point of adding it, it didn’t look right, so I skipped it. 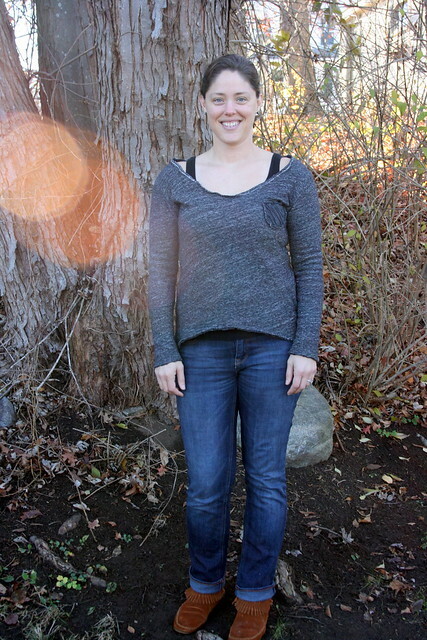 This is a really quick and easy pattern, so I just resigned myself to wearing the sweater with a tank top underneath until I could figure out how to fix the neckline. 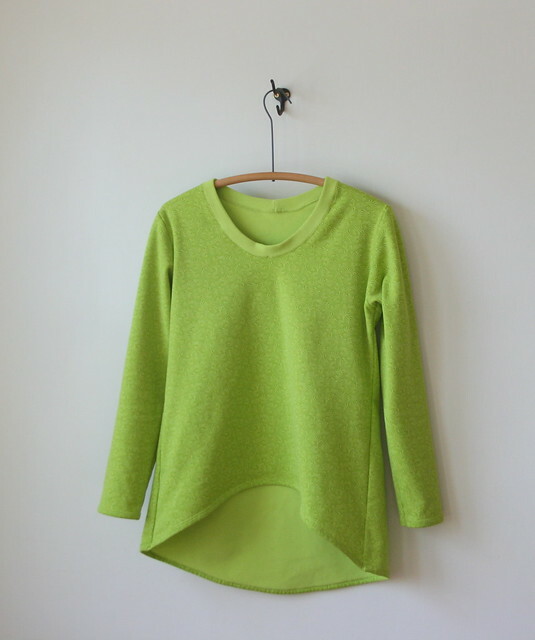 I bought twill tape to sew into the shoulders and around the back of the neckline after the fact to sort of hold things in place…but I haven’t done it yet……and I just love the sweater. It’s a little chilly around the neck when it gets cold out, but that’s a great opportunity to wear the cowl my friend knitted for me (thanks, Audrey!). 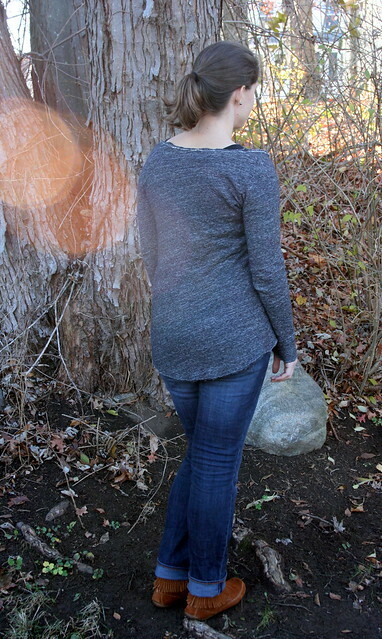 All in all, even with its “imperfections”, I love this sweater. 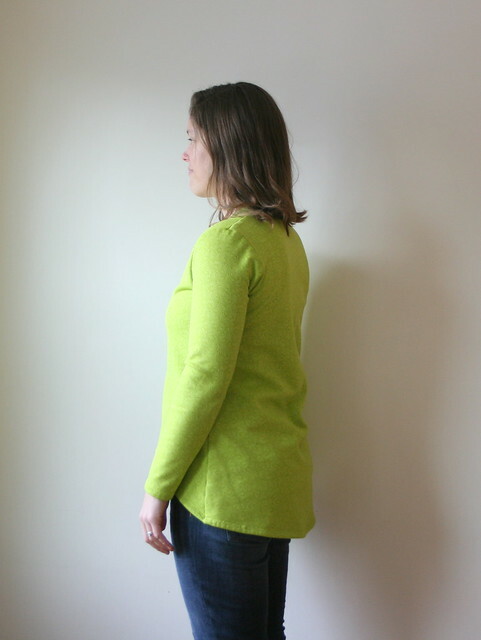 I’ve already made a second one (still to be worn, photographed, and blogged), and this time I made sure to stabilize the shoulders. Gotta learn the lessons, right? I think more Briars (and mini-Briars) are in my sewing future. 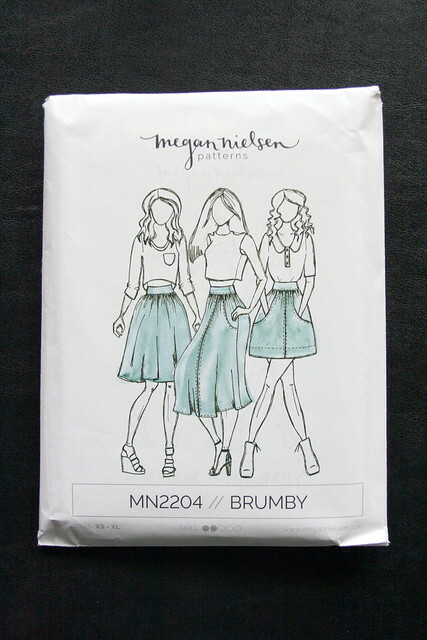 Today I’m happy to share with you one of my latest projects, the Brumby Skirt from Megan Nielsen Patterns! I really went back and forth on this one before starting and did lots of “research” checking out others’ versions of it around the web. 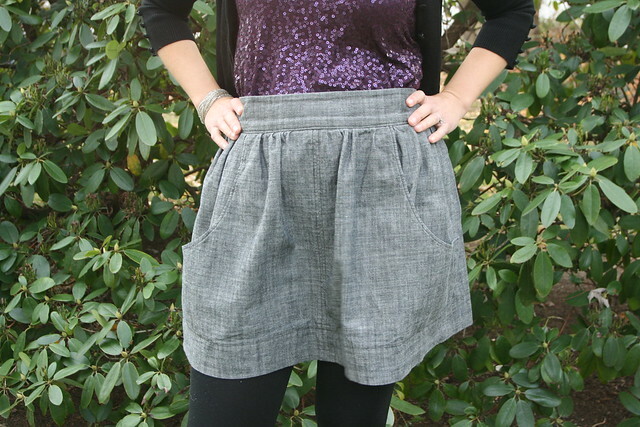 I’m still not super sure if I like the high-waisted skirt look on me, but I thought I would give it one more try before deciding for certain, especially since I won this pattern in the Refashioners contest and had the perfect fabric for it–some linen from Pintuck & Purl! So, I planned to make it closer to knee-length. 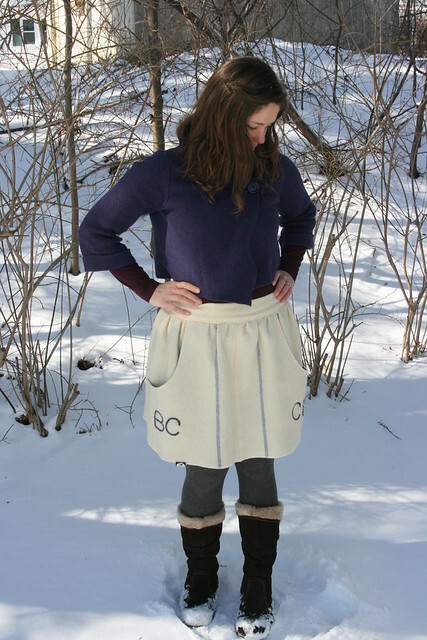 I had, however, read Lauren/Lladybird’s post on her Brumby skirt and remembered that she said she had been underwhelmed before hemming, but loved the skirt when it was the specified length. Well, my experience was exactly the same. I made it up but didn’t hem it, and it was very blah. 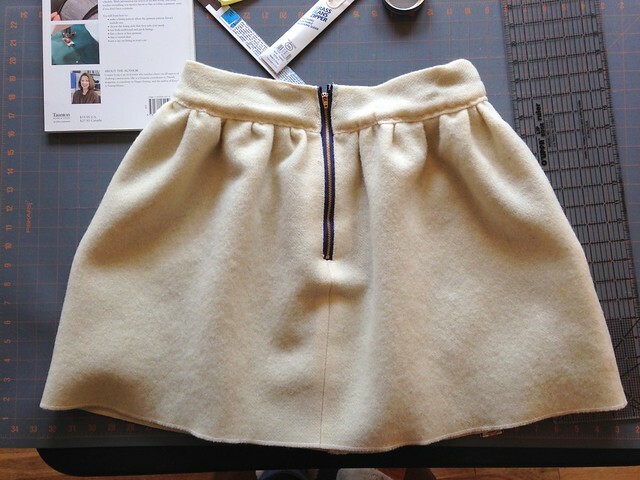 So, I decided to pin it up to the length in the pattern…and that’s when it happened. I don’t know how she did it, but Megan Nielsen put some magic in this pattern. 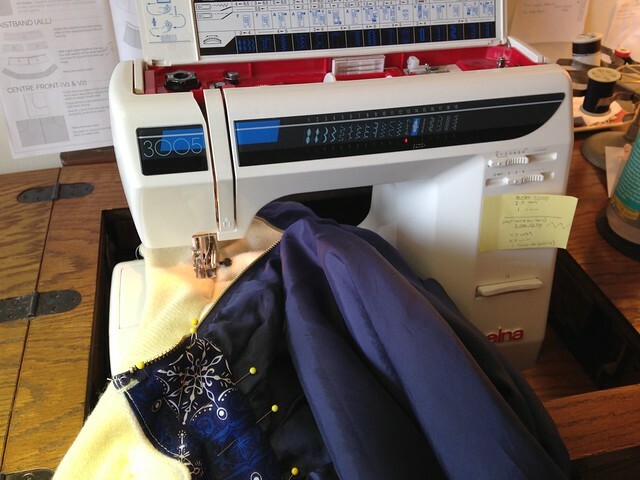 When you hem it, it transforms! I love it! So, here are some details and design decisions I made. 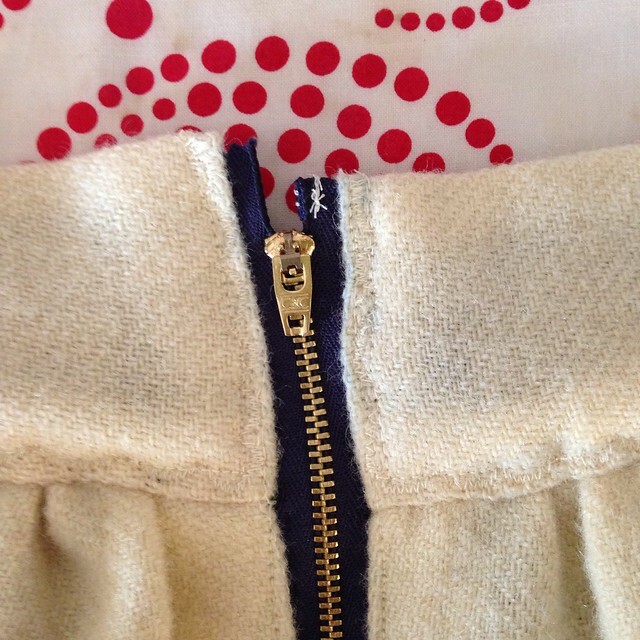 Initially I was going to put in this gorgeous silver zipper that I bought at Pintuck & Purl, but I would have had to shorten it…and it was a metal zipper. I know it’s possible, but not having ever tried this, I didn’t think I wanted to try it for the first time on a very fancy zipper. 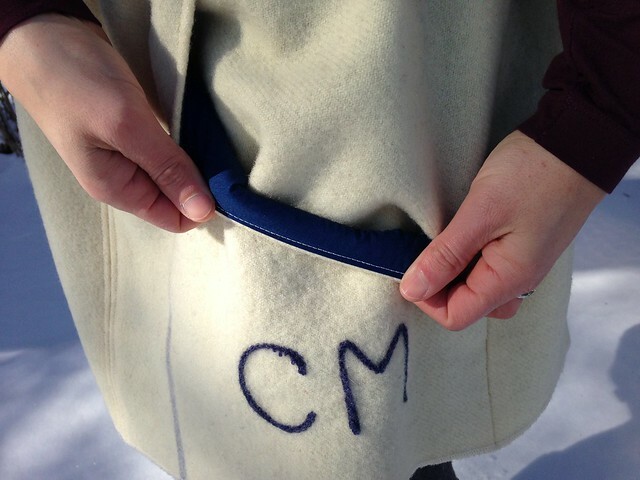 I also thought about topstitching in silver (I was really getting wooed by that silver thread! 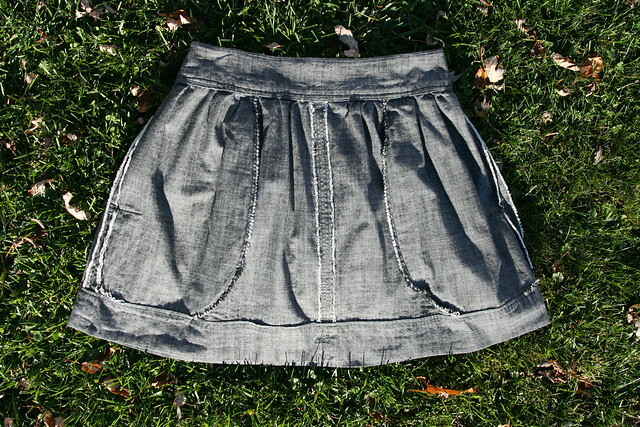 ), but in the end, I decided on black thread and a metal zipper with black tape (that I wouldn’t have to shorten). 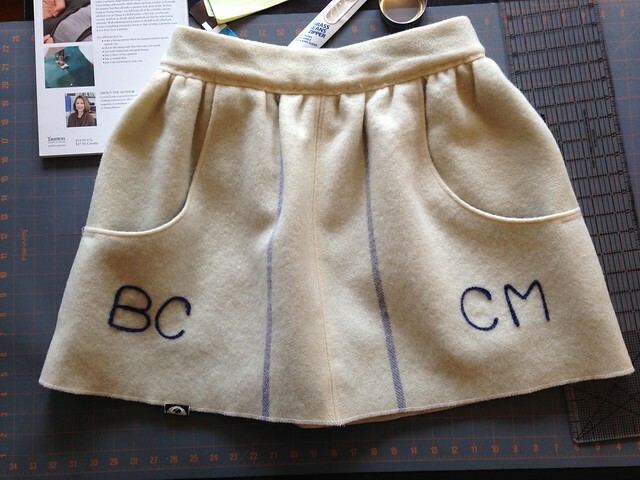 I realized this would make the skirt more every-day in a good way (i.e. it will get worn more). 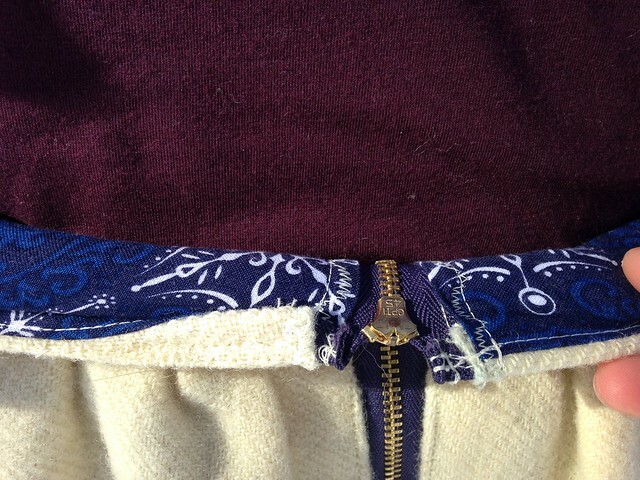 I’ll save my fancy zipper for a future project. 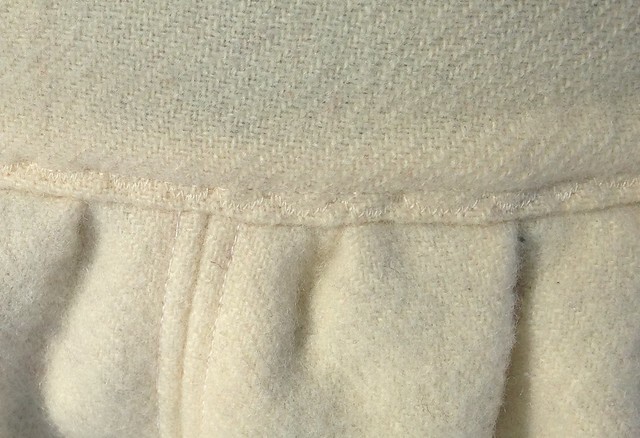 Front view–it’s hard to see the topstitching, but it’s there! 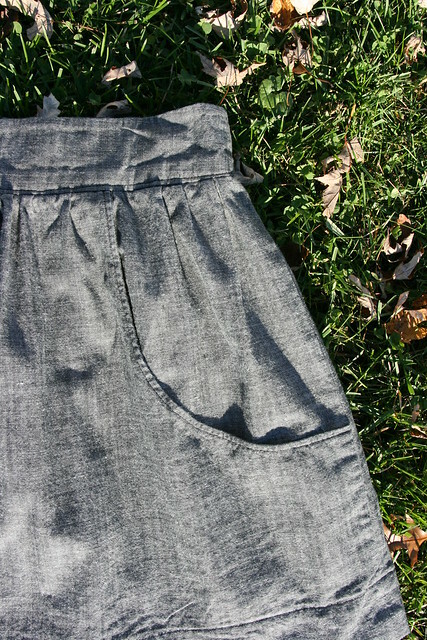 Things I wondered about before starting this project had to do with ease around the waist and the depth of the pockets. 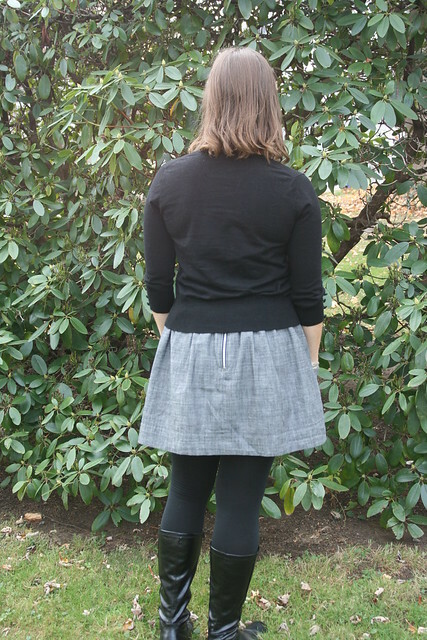 Having only made the one high-waisted skirt (the apple skirt), I wasn’t sure how things would work out if the finished measurement was the same as my actual waist measurement. 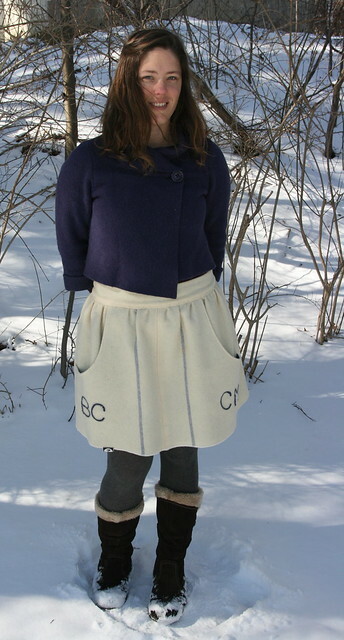 I wondered this with the apple skirt, too, so I actually added a few inches to the waistband to be safe. With this pattern, I decided to risk it and just made it as it was printed, and it worked out great! It’s very comfortable and not too tight at all. I noticed in my travels around the web that the pockets looked deep enough that they weren’t actually supporting anyone’s hands–which is the case. It’s like your hands are straight down at your sides…but I still love those huge pockets. I can keep things in them and you can’t even tell! 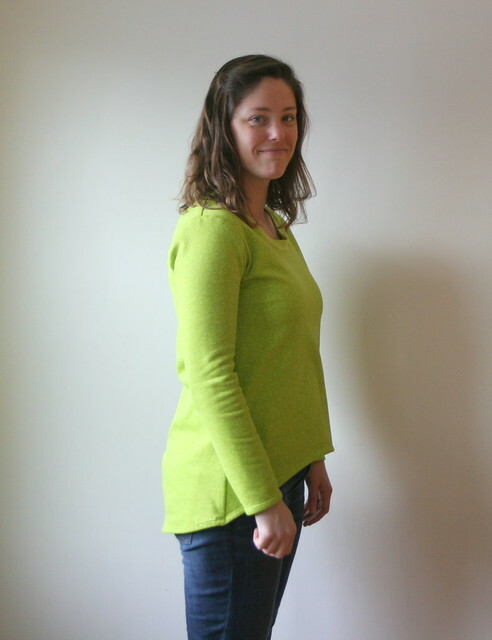 I did end up doing just a little topstitching at the edges of the pockets (which was an optional suggestion) so that they wouldn’t stand out as much, and that has been great. 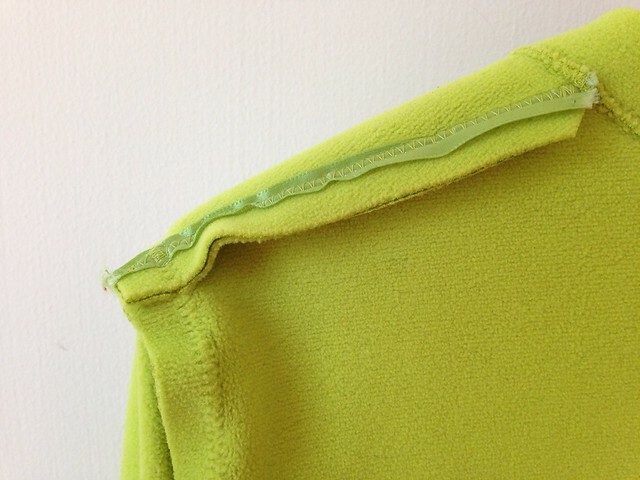 I also managed to catch the bottom edge of the pockets in my hem on the inside, which tacks them down nicely. 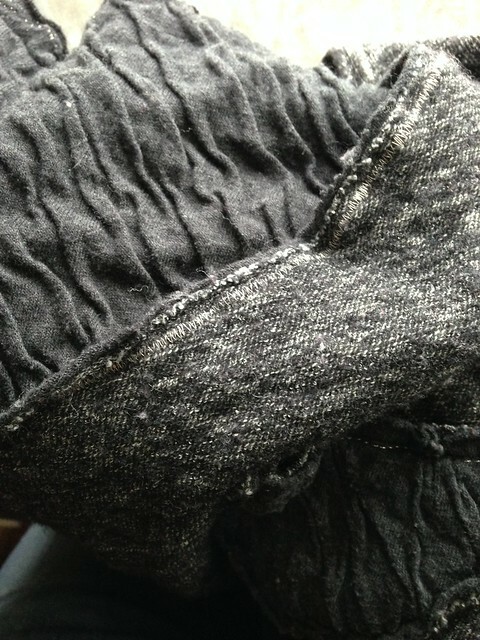 As far as seam finishing goes, I just zigzagged in the seam allowance and then trimmed the seam with pinking shears. This does lead to some strings and fraying after washing, but I think that will stop soon. 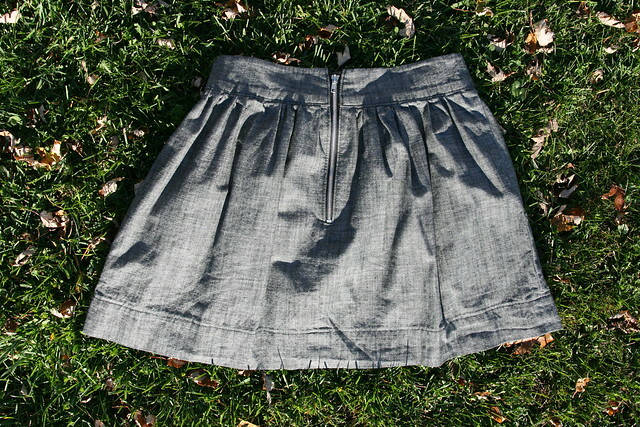 This fabric is a nice, substantial bottom weight, and French seams didn’t sound like fun on this one. This was a fun and easy pattern. 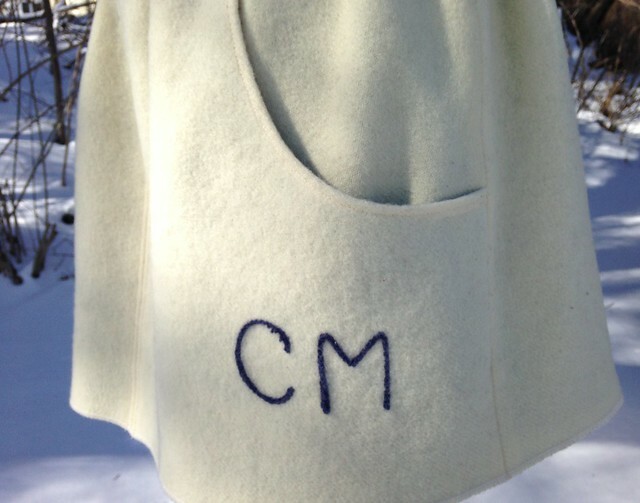 I am sort of curious about how it would look in wool–I have a few pieces that were given to me. 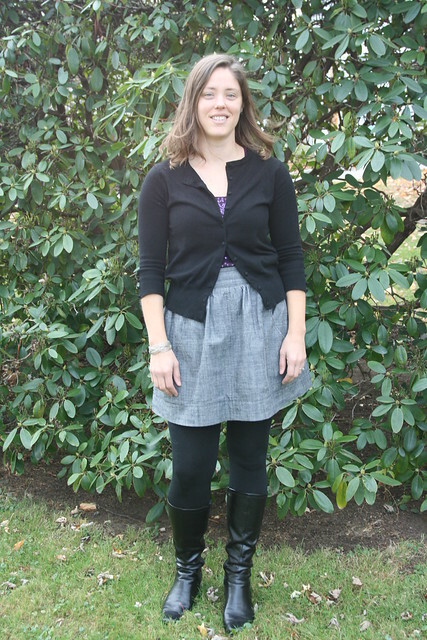 With these cozy fleece-lined tights, I wore this skirt four out of seven days. Yes–I totally do that, especially if I’m not going to see the same people every day, but don’t worry–there were some laundry days in there. 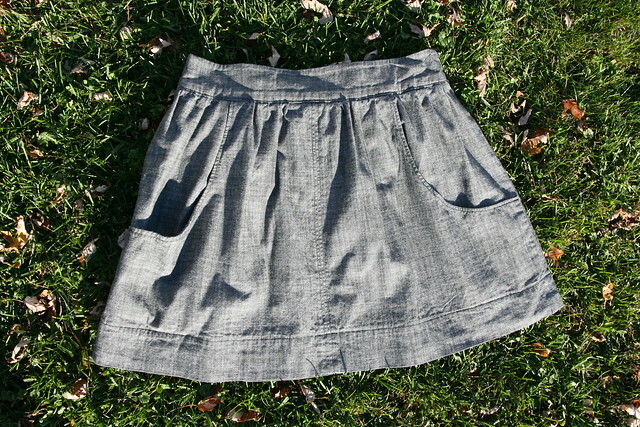 😉 I think this will be a great early fall, late spring, and summer skirt. 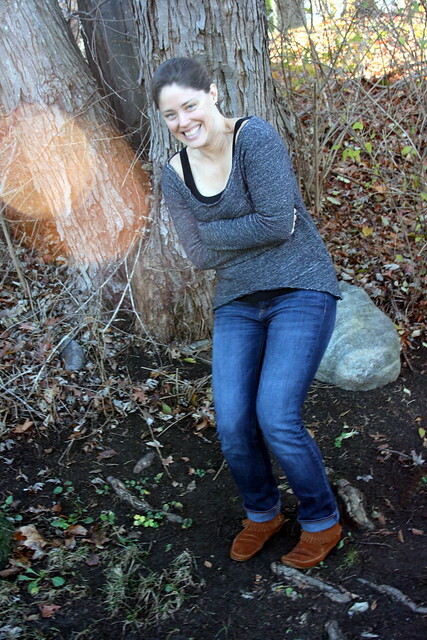 The more I see of Megan Nielsen’s company, the more impressed I am.